In your old age, it’s only natural that your body isn’t what it used to be. Despite our best efforts, aging is simply an inevitability, and no matter what you do, you’ll reach a point where certain activities just aren’t available anymore. This is hard for people who enjoyed highly active lifestyles or physically intensive activities. However, there are still all kinds of activities you can do, even if you mostly live a sedentary lifestyle. As homecare professionals, we have met countless elderly people who have found new hobbies, passions, and talents that can be done with limited physical effort. 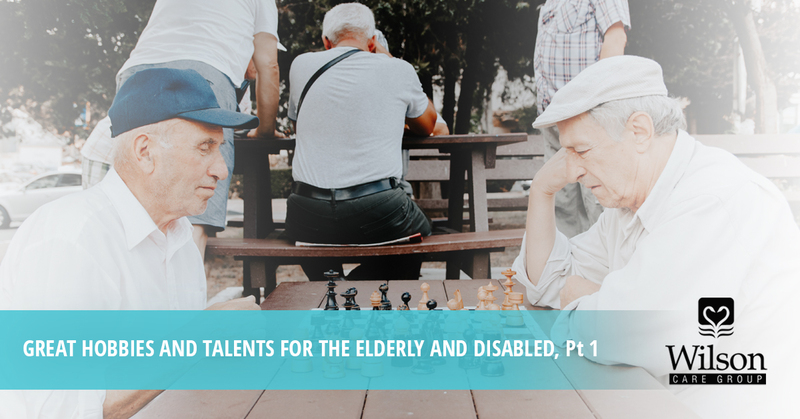 In this two-part blog, we’ll take a look at some hobbies and talents you can develop without having to leave a bed. In the first post, we’ll look at talents that you can continually improve on, and in part two, we will focus on fun hobbies. A lot of people incorrectly assume that all good artists started from birth and that it’s not worth pursuing as an adult. This is absolutely not true! Everybody is capable of producing art, and if you just give it a try, you might discover that you like it. Art is wonderful for those who require homecare services because it is an activity that doesn’t require you to move around. You can paint pictures in your bed with your paints beside you, or simply pick up a sketchbook and start drawing while your favorite movie plays. Another boon to art is its therapeutic nature. Art is a great stress-reliever, and if you’re doing it as a means to express yourself rather than make a living, you can take it easy drawing or painting whatever you want. The other bonus with art? You can leave your drawings and paintings behind for your family. They can, in a certain way, be your legacy. If you’re at a point where you’re receiving home health care visits, you’re probably not in a position to carry around a giant tuba or rock out on a drum set on a regular basis. That being said, there are plenty of musical instruments you can learn when you live a sedentary lifestyle. You can play the guitar sitting up in bed, or if your fingers aren’t quite strong enough for that, you can go with something lighter and easier, such as a ukelele. Flute instruments are also viable, and if you want to learn the piano, consider getting an electronic keyboard that can rest in your lap or be easily set up on your bed. Even a simple instrument like a harmonica can be picked up, and you’ll experience deep satisfaction as you slowly progress to the point where you can create beautiful music. The “old lady knitting” is somewhat of a stereotype in television and movies, but there’s a reason why you see it so often — knitting is legitimately a lovely activity for people who can’t live an active lifestyle. Knitting is therapeutic, creative, and it passes the time well. Much like creating art, knitting is also valuable because it allows you to create things that can be passed on to other family members. If you don’t fancy yourself a painter or knitter, there are plenty of other ways to create! Crafting is a popular activity among the elderly because the sky is the limit in what you can’t create. If you’re able to procure supplies, you can chase any idea in the world that you want. Need ideas? You can order crafting magazines and browse the web for fun and exciting projects. As a bonus, this is also a great activity to do with friends or a spouse! If you’re disabled or otherwise unable to perform taxing physical activity, it’s good to find positive outlets that you can devote your time to. In the meantime, you’ll need someone to help you with some of your other needs. At Wilson Care, we’ve been performing senior homecare for years, and we will help you to live a happy, healthy life. We having nurse aide care services, which provide companionship, meal preparation, medication reminders, personal care, and light housekeeping tasks. Contact us today if you’re in need of homecare services, and be sure to check out part two of this blog post!